Facebook’s advertising guidelines include a 20 percent text rule, meaning that the text on ad photos cannot take up more than 20 percent of the photo. We should note that this guideline is only specified for ads featured on the News Feed! If you’re planning on promoting a post or doing a News Feed sponsored story you need to follow this rule. You may be thinking 20 percent is not a lot of space and the truth is, it isn’t. The good news is, text on photos is not necessary to build powerful Facebook ads. Here are 3 ways to design effective ads while following the 20 percent text rule. You’ve heard the saying, “A picture is worth a thousand words?” Well, your ad photo/image is the first thing people are going to see. A majority of the time if someone chooses to read your ad copy it will be because the photo or image is compelling enough for them to seek more information. Be sure to use a hi-res photo that is clear and not too cluttered. We recommend using a human in your photos. People are on Facebook to socialize with their friends and family so showing the human side of a brand adds some personality and is more attractive than a logo or a product photo. If you want to show your product or company headquarters/store etc., consider featuring a photo of someone using your product or standing in your business. A while back we wrote a blog post on how to find images for Facebook and your blog, it provides some best practices for finding compelling and engaging photos. The good news about the 20 percent text rule only applying to News Feed ads is you have a lot of space to work with for content. This helpful document from Facebook, breaks down every type of ad and provides recommendations for the number of words and image sizes. It’s safe to say Facebook’s recommendations should be taken in high regard! 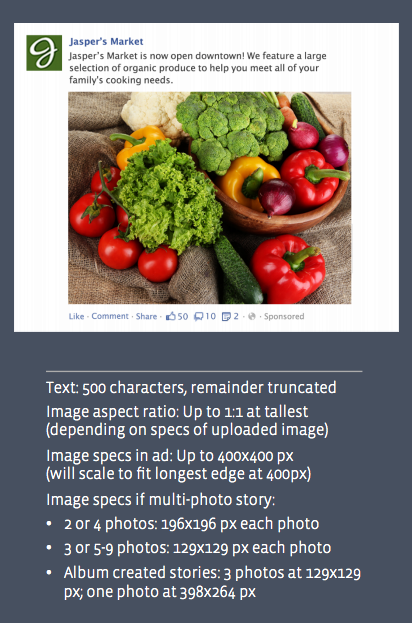 You’ll see that Facebook recommends no more than 500 characters and an image that is 400x400px for News Feed ads. This means you have up to 500 characters to further engage and sell to your audience. Because Facebook users are used to reading status updates supported by a photo it’s more likely your ad content will be read and your photo becomes more of a supporting document, something to draw the eye in. If you absolutely must include content on your ad images, Facebook has created a nifty tool that will save you time and frustration. This tool allows you to upload your photo and then you can highlight the boxes that contain text and Facebook will tell you what percentage of that photo is text. There’s no simpler way to design around the 20 percent text rule than this. As we stated in the beginning of this article, the good news is that Facebook’s 20 percent text rule only stands for News Feed ads, so you have the support of a status update to accompany your ad. As always, if you have any questions please let us know. If don’t know the answer off the top of our head, we’ll find it for you!